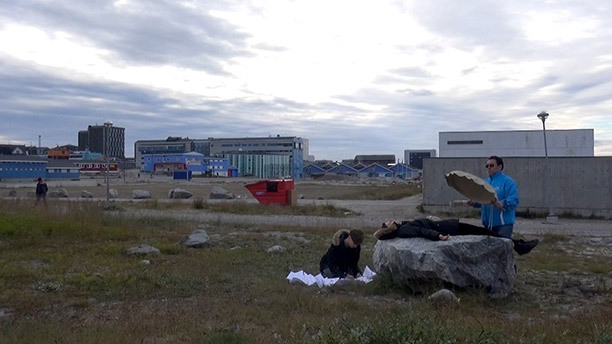 The artist duo J&K are initiating a series of text pieces for Greenland Eyes International Film Festival through a performative writing situation in the foyer of Katuaq. In collaboration with drum dancer Leif Immanuelsen the artists search for insights to inspire their writing process. Katuaq and locations in the public space, Nuuk, Greenland. Wednesday, 3rd of September, 2014, Katuaq Foyer 18.30-19.00. With the project Dark Ice the artists are on a quest to excavate forgotten or near-lost radical wisdom from the ancient culture of the Inuits in regards to the human capacity to live in extreme nature conditions. 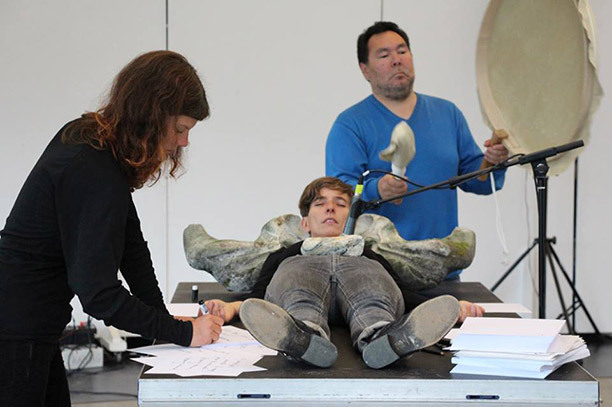 Based on research made in Nuuk and into the history of Greenlandic culture the artists will compose a series of text pieces that will travel along with the film festival across all the Nordic countries acting as a cultural meditation and as a direct link from and to Greenland. Dark Ice is developed for Greenland Eyes International Film Festival and supported by The Danish Arts Fund.